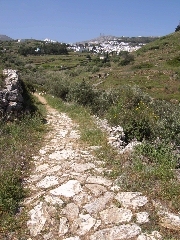 Evaluation: This is the classic walk on Paros, the so-called "Byzantine road" part of an old medieval path. 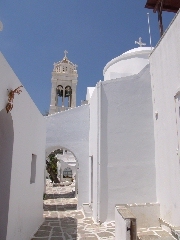 It is one of the few walks on the Cyclades where you can meet large groups of walkers! The route is pretty well marked with a trail marker , but as so often, the starting point is not so clear, both in Léfkes and in Pródromos. The hike deserves an evaluation of ***. Estimated time: The actual walking time is a little over one hour until Pródromos and the return route takes also just over one hour. But while the actual walking time is in total about 2h15, the TWT (total walking time) soon mounts to 5 hours - we walked from 11am to 4pm, with a lunch at the restaurant on the platía of Pródromos. 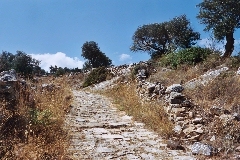 (0h00) At the bus stop, where the road bends to the left to Márpissa, you go straight into the village on the paved road (signpost Léfkes). You take a left almost immediately and a little further you descend to the left again; when you get to a crossroad, you take a left again. Now you continue walking straight ahead, you go up again and in this way you reach another crossroad after about 3-4 minutes. In front of you, you notice a house with a bell. The house with the bell Léfkes. You have to go to the far right and after 20 meters you see the first sign pointing to the Byzantine road. A little sign to the byzantine road. You veer a little to the right and a bit further you arrive at a second sign, next to a little church. So you go left and you continue to follow the picturesque and descending street - and all of a sudden you notice a trail marker  on a wall of this beautiful street. A street in Léfkes, at the betinning of the walk . You reach a clearing with a little concrete road in front of you – on the left of this road, you find the beginning of the trail (signs and the trail marker ). 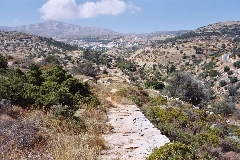 The beginning of the Byzantine road from Léfkes to Pródromos. (0h07) Already after a few minutes you get to a stretch with some nice pavement and you descend on the right side of a grassy valley that runs below the main church of Agia Triada. After another few minutes, there is a second stretch of pavement and behind you there is a nice view of Léfkes. You climb slowly on a dirt path and the valley on your left gets deeper. (0h21) A little less than fifteen minutes after the start of the path you already reach the highest point, and soon thereafter there is the beginning of a long stretch, slightly going downwards, which is nicely paved - Náxos lies before you. 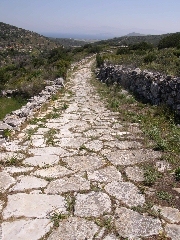 The marvellous pavement of the byzantine road: a look behind you (left) and before you. The path is still very nice and you can see it before you as it continues on the slope before you. First, however, you descend into a side-valley and you cross a nice bridge. A nice bridge between Léfkes and Pródromos. (0h31) You climb up on the other side, and after a beautiful stretch of about 16-17 minutes, you almost reach the top. The path then gets narrower and rockier. 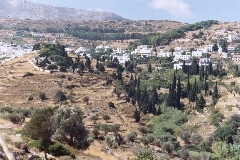 You cross the hill top and the plain emerges before you: to the left you see the hill of Galiós and to the right the height of Kéfalos with Agios Antónios. At the foot of this hill lies Mármara (to the left), Márpissa (higher and to the right) and Pródromos (closer to you) - and you can see quite nicely how the path goes down to that village. In the sea you can distinguish Naxos, Irakliá to the right and Ios on the far right. (0h42) The pavement starts again for about 5 minutes and then the path gets rockier again. After another six minutes and a final little stretch of pavement, you come to a gravel road, running alongside the wall of the first house. Sometime later you reach a little concrete road, where you go left – but you turn right immediately thereafter. After another 2-3 minutes you reach a crossroad next to the wall of a house  and you take a left. A little further, you come again to a crossroads, with before you a map of Pródromos and a no. on a pole: you go right, then you take the little street off the left, you continue straight ahead and so you come to a passage under a tower. On the square you notice the very nice restaurant "O Tsitsínis", with a lovely garden at the back. As you continue to walk on the square, you reach the paved road: the bus stop is to the left, next to the bakery. (1h05) If you decided to walk back, you start from the asphalt road, at the bus stop and the bakery - and just opposite the road to Mármara and Mólos off the left you go up on the right and so you arrive at the little square again. At the far end of the square you notice a nice arch, where you can pass under the bells and thus to the left of a little church. You continue immediately to the right, a little further you curve to the left, and you do NOT take a right, but you continue straight ahead. A little later, you go left and after 10 meters you take a right. In this way you can walk through the passage under the tower. Then you go to the right twice and you leave the village. After a little under 5 minutes you reach the concrete road (with on the right the map and a no. ), and you take a left. 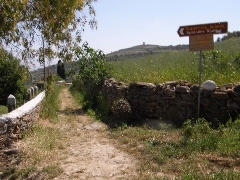 (1h11) After 1 minute, you keep a little to the right  and after another few minutes you reach the beginning of the path, on the right: at first it is a small gravel road (sign "Byzantine path" and ). From now on the path is unambiguous! Pretty soon you come to the right of the wall near the house and you start to walk up, at first on a nice pavement; further on, the trail is stony or rocky. After a while you climb faster, alternately on paved or on rocky stretches, and so you come near the top. You then reach a really beautiful and paved stretch - a real kalderími: the path used to be quite wide here, but it is partially overgrown or ruined. Looking behind you towards Pródromos. The kalderími in the direction of Léfkes. (1h29) You cross the wide, rolling hillcrest and the path narrows again: Pródromos disappears behind you, you pass a high wall and, as you begin to descend, Léfkes appears before you. You then get to yet another beautiful stretch and you notice the beautifully winding kalderími continuing before you. 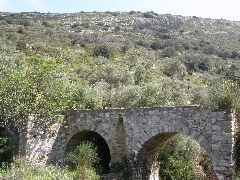 You descend into a side-valley and you cross the bridge in a beautiful valley, covered with olive trees and filled with flowers. 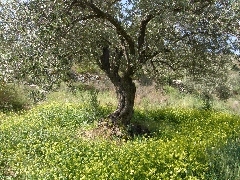 However, the most beautiful part of the broad kalderími is yet to begin, midst olive trees and other greenery. At first the climb is fairly steep, but later on it gets more gradual – all together the climb takes a little over 11 minutes, before you reach the hill crest; Léfkes is much closer now. 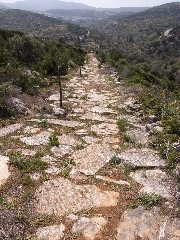 The nice byzantine path to Léfkes. (1h51) At this point you get to the end of the beautiful pavement, after a wonderful stretch of about 18 minutes. You reach a sandy path, with a beautiful view over the east side of Léfkes and the large amount of cypresses. You descend and you go up again, the great church is now on your right and you end up in the western part of Léfkes, on the left-hand side of the valley.